The first two rounds of deer season have came and gone and we’ve seen plenty of kiddos with their first shots and awesome trophy racks on big bucks. The final wave of firearm season is approaching(Nov. 30-Dec. 2) and while this hunting season allows only antlerless harvesting, it’s still an opportunity to put meat in the freezer. Many Missourians will be sporting orange and toting their firearms and we’ve compiled a bit of information that may be useful for those new or anxious hunters. You were born before Jan. 1, 1967. You are a resident landowner using those permits on land that you own or lease.You must have your permit when you go out to hunt. The MO Hunting App allows you to carry those effortlessly on your cellular device. Safety is imperative when mixing firearms and entertainment. There are thousands and thousands of participants in deer hunts in Missouri, so it’s important to wear bright orange hunting gear to be sure you’re seen by other hunters and vice versa. 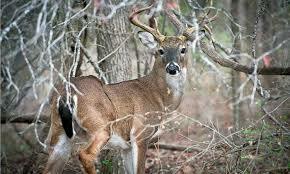 A lot of the information we know about deer in Missouri comes from the studies done by the Department of Conservation. There’s a current research project going on where both male and female deer have been caught, collared, and released to further understand their movements and survival. IF you see a collared deer while hunting, it’s important to NOT let the presence of a collar influence your decision to harvest or not harvest the animal. If you’d normally shoot the deer, please do so. But if you harvest one of these deer, please call the number listed on the collar as soon as possible. For more information about these research projects, contact Barbara Keller at (573)815-7901. During antlerless season, you are allowed to harvest: does and button bucks, bucks with spikes less than 3 inches long, and bucks with at least 4 points on one side of their rack. The deer that are protected during this time are all antlered deer. “Antlered” deer have at least one antler that’s 3 inches or longer that DO NOT have at least 4 points on one side of their rack. Don’t count on getting any big mounts during this portion of the year. Immediately after harvesting a deer, you must notch your permit. IF you decide to leave the game that you’ve harvested, you MUST attach a tag to it. Before 10pm the day you harvest the animal, you are required to check your deer in. If you’re using paper permits, you follow the instructions listed on page 63. If you’re using the MO Hunting App, select “Telecheck,” and follow the prompts on your screen. Once this has been checked, your deer is able to be processed since it’s labeled with your full name, address, date taken and Telecheck confirmation number. Then and only then is it legal for you to transport your new deer out of state. Always check regulations of other states regarding deer transportation prior to traveling. You may contact the Greene County Conservation Department by calling (417) 766-7380.